If you are installing or are interested in ANY other Video Entry Access Door Station, STOP and take a look at DoorBird! Made in Germany, Sold and warrantied here in the U.S. by authorized dealer 007 Systems. Doorbird can integrate with your home control system giving it the ability to automatically turn on lighting when its built in motion sensor is triggered or button is pushed. 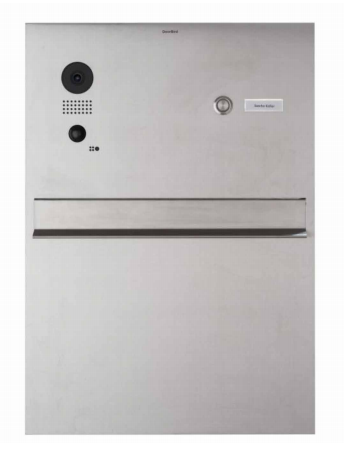 You will then get notifications and can view the camera, turn it's night vision on and monitor and control your doors or gates for guests or deliveries. Complete control of your doors and gates is now possible from wherever you are. ​You will never miss a visitor again. Answer your door anywhere in the world with your smart phone and the Doorbird Video Door station. ​See and have 2 way voice conversations with guests when they push the illuminated button at your front door. Then let them in, by tapping the key icon in the app. You are at work when your phone "chirps". It' s your Doorbird video door station calling you from home. So you answer the chirp to see the delivery man delivering a very expensive item you ordered a few days ago. He wants to leave the item at your front door but you know if he does, it will probably be stolen. So you unlock your door for him and you watch the door open. You watch him drop the item(s) inside and close the door. He then thanks you and you lock your door knowing your item(s) are safe in your apartment home or your garage. Remove your existing doorbell. You will then see at least two wires in your wall. Connect your new DoorBird video door station to those wires and mount it near your door. Set up your app and connect the DoorBird to your router using WiFi or an Ethernet cable. Your DoorBird uses bank level encryption technology, so you are protected. ​You will now receive instant alerts (push notifications) on your mobile device if someone moves in front of the door station or pushes the doorbell button. You can then see your visitor and have the option of a 2-way voice conversation with them. The conversation is in real-time with no lag and of course the option to be able to unlock the door for them. All from the DoorBird app! Compare DoorBird with other video door stations. Please Scroll down to see all of the models. All of the DoorBird models have the same electrical features. The only difference in the models below are the face plates and enclosures. For more information on this product, please go to it's product page here. The Birdguard is a self contained alarm system. It operates just like the DoorBird but does not have a button. Place it anywhere in your home or in your garage or backyard to get video and motion notifications when anyone enters it's field of view or open the app anytime to see a live view of the area. Ethernet or WIFI connectivity.